My good friend and swimming buddy knows all about my desire to lose weight and to get back into cute clothing (especially dresses). This of course lead her to recently asking me if there were any specific items of clothing that are helping push me towards my goal. There are actually quite a few different dresses that I can't wait to feel the zipper go up on, but that's mostly because I own a lot of dresses I don't currently fit into. While I would have to pull out my Rubbermaid boxes with all of my skinny clothes to look through what I have, there is one dress that sticks out in my mind. Funny thing is...it is yellow and we all know how much love that color has been seeing from me! Anywho, the dress is from Betsey Johnson, who lets face it makes amazingly fun, girlie dresses. I found it in her store at the Dallas Galleria 4 years ago and it was instant love. 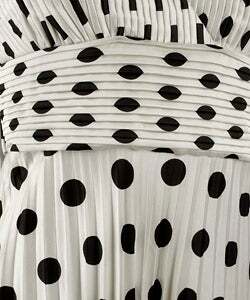 It has everything this girl loves...a halter neck, pleats, movement, spin/swirlability and polka dots! Seriously, put polka dots on something and I will buy it! A few years after I bought this dress "House Bunny" with Anna Faris came out. In one scene she stands over a manhole cover and puts on her best Marilyn Monroe...but instead burns her who-ha. But as she stood there...with that dress puffing up I realized that she was wearing my dress! This dress does just that...it makes you want to pull and Marilyn, to spin, to be just down right feminine in every way. When I wore it I felt happy. It was full of life and everything wonderful about warm weather. I cannot wait till I can fit in it again. When I hit that size, you will find me wearing it proudly and giddily. I'll even try to not burn my va-jay-jay! I have a feeling you will be making it into that dress even sooner than you think!